(Daily file photo by Noah Frick-Alofs) Matt Moderwell evades a defender. The junior midfielder tied the game in the 54th minute with the first goal of his career. Getting outshot 22-4 is normally not a recipe for success. Unfortunately for Northwestern, playing against the No. 2 team in the country does not make it any easier. The Wildcats (4-3-2, 0-2-1 Big Ten) battled back from a 1-0 deficit to tie the game early in the second half before No. 2 Indiana (8-1-0, 2-0-0 Big Ten) scored the game-winning goal with four minutes left in regulation and earned a 2-1 win. NU has struggled with controlling possession this season and that continued against the Hoosiers, who kept the ball in their attacking third for the bulk of the first half. When the Cats did gain possession, Indiana’s pressure limited their ability to move the ball. While NU didn’t get a shot off in the first half, the Hoosiers had plenty of chances to score. Indiana took ten shots in the first half and converted in the 19th minute. 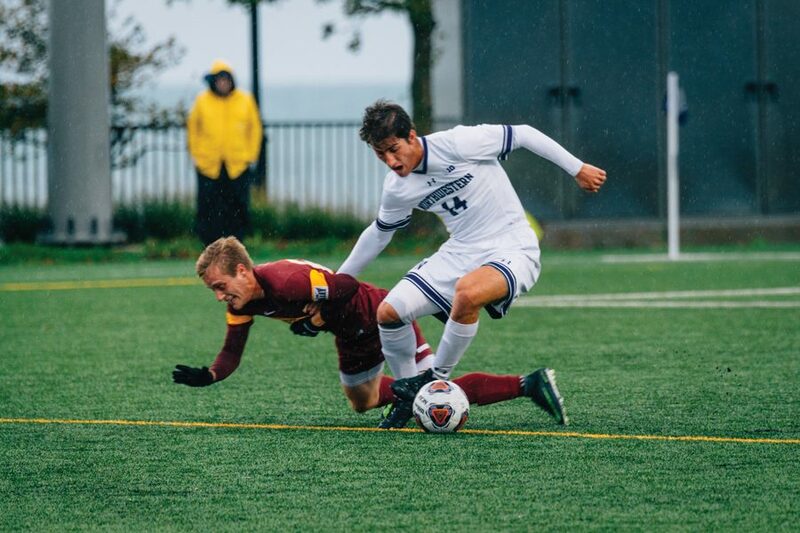 Justin Rennicks moved his way past three NU defenders and put himself into a position to take a left-footed shot that went past the outstretched arm of sophomore goalie Miha Miskovic. Junior defender Matt Moderwell said the Hoosiers asserted their dominance early. The Cats began to gain some traction offensively in the first half and Miskovic said they slowed the game down and played to their standards. NU came out more aggressively at the beginning of the second half and dominated the ball in the offensive third as their aggressiveness paid off. Less than 10 minutes into the second half, Moderwell scored the first goal of his career. A pass from sophomore defender Garrett Opperman set Moderwell up in the box for a shot that went past the goalie into the bottom right corner of the net. Once the game was knotted up at 1, the Cats had a important choice to make. Even with NU’s defensive approach, Indiana’s offense picked up its play. After Moderwell’s goal, the Hoosiers outshot the Cats 11-3 and with four minutes remaining before overtime, Indiana’s sophomore midfielder Griffin Dorsey scored the game-winning goal to break the Cats’ hearts. With this loss, NU is still looking for its first conference win and its first win against a ranked opponent this season. This was the first time the Cats had trailed in a game all year. Although it wasn’t the result they wanted, Lenahan said the Cats grew from this game against Indiana’s talented roster.